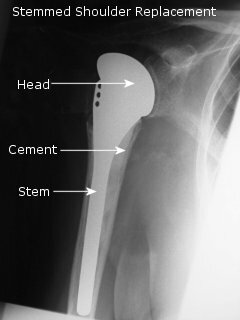 The traditional shoulder replacement has a metal stem which is put down the inside of the humerus (Figure 1). Due to this stem there are potential problems associated with removal of the humeral head, component placement and problems related to the cement required to fix the replacement. For arthritis, only the surface of the joint is affected and thus Mr Stephen Copeland questioned the necessity for a stem The Copeland surface replacement was developed by Mr Copeland to avoid most of the difficulties and complications related to the traditional stemmed designs (Figure 2). "For arthritis, there's absolutely no reason for using a stem at all. It's got huge disadvantages because, if it does fail, then getting it out can be real difficult and present many problems," Copeland has said. 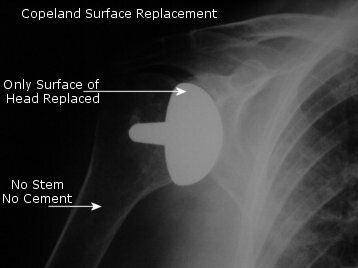 If a revision is required, surface replacement of the shoulder leaves the surgeon and patient at a better starting point than does a stemmed humeral implant. "The only bone you'd then remove would be the bone that you would have removed the first time around using the stem prosthesis," Copeland said. Results with the Copeland shoulder "in terms of movement, pain relief — all of the normal parameters you use for joint replacement — are the same as any other large series from any good centre." So far thousands of patients have undergone the conservative shoulder surgery in more than 14 years. Approximately 50% of the cases had OA and the other half had rheumatoid arthritis or avascular necrosis. The main reason for this operation is to reduce the arthritis pain in your shoulder. The operation replaces the damaged surface of the ball of the joint. This type of shoulder replacement is called "the Copeland Shoulder". Occasionally a different type of replacement may be used. The doctors will discuss your individual surgery before the operation. For more information see click here. You should not eat or drink anything after midnight the night before the procedure. You will probably be able to go home the same day. You will usually be in hospital for less than a week after your operation. Following surgery you will be in a sling. This is for comfort only and you may take it off as you wish. A physiotherapist will see you in hospital to give you advice about using your arm and exercises. Outpatient physiotherapy will be arranged when you are discharged. In the first three to four weeks you will be quite one handed which will significantly affect your daily activities. As your pain improves so will the amount you can use your arm. Driving and most light activities are usually possible four to six weeks after the surgery. However the strength in your arm will take longer to improve, and will be dependent on the amount of pain and stiffness you had prior to the surgery. A doctor or physiotherapist will discuss this with you.